On Adam Rubenstein’s recent solo European tour, he arrived at a show a few hours early, loaded in his equipment, and plugged in everything on stage. As he made his way to the bar, he was stopped by a woman carrying a guitar case. “What are you doing?” she asked. “I’m playing here tonight,” said Rubenstein. Confused, the woman replied, “Well that can’t be. I’m performing tonight.” As it turned out, Rubenstein had set up his gear at the wrong club — a career first. The smaller venue he was booked at was actually across the street. Embarrassed, he quickly gathered his things and, now rather late, hurried to the correct location. 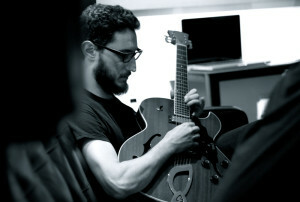 For more than a decade, Adam was the principal songwriter for indie favorites Chamberlain. With the support of his four bandmates and a healthy stable of fans, they released three acclaimed albums and navigated their way through many successful tours free of complications and wrong addresses. Now, as a solo artist, the landscape has changed dramatically for Rubenstein, who admits he often feels lost as he thumbs his way through uncertain territory. One could argue the opposite judging from Rubenstein’s third solo album, Nightly Waves, due out September 18th on Arctic Rodeo Recordings. This powerful and diverse group of songs proves he’s doing something right. However, writing the record wasn’t without its challenges. For Rubenstein, an album usually starts with a clear idea — a catalyst that sends the whole process into motion. His last album, Excavator, was born of a deep examination of the past — admittedly a best-of collection of once buried ideas. Its predecessor, Aftershock (released as Adam Dove) was triggered by the emotional divorce of Chamberlain. This time however, Rubenstein had to manufacture an impetus to start writing what would become Nightly Waves. He found it in from an unlikely place—one of contentedness. Rubenstein found that composing songs from a place of fulfillment allowed for less introspection and self-doubt. It made the process a quicker one, but no less rewarding. The result is a dynamic and spirited collection of music. The epic, Brian Wilson-inspired power ballad “Common Home” deals with the unbreakable bond of family, as vocal harmonies intertwine with lush orchestration. The roots-tinged “Crooked Wheel” details a newfound and confident sense of self, with mandolin and synth pulsating along at an energetic pace. However, Nightly Waves has several of the somber and melancholy moments for which Rubenstein has long been known. The dark and ethereal “Graceful State” conjures up the aching lament of Tom Waits with in its distant drums and ghostly chord progression. And the Chamberlain-esque “End Of The Aisle,” while positive in its message, marries Rubenstein’s calming voice with some subdued yet emotively charged guitar and bass interplay.